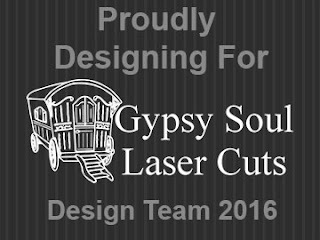 Good morning love Gypsy Soul Laser Cuts Fans!!!! Gypsy Soul Laser Cuts Design Team. that are available in the store!!! if you need chipboard slats please contact Gina at Gypsy Soul Laser Cuts to get them. Cut 17 pieces of pattern paper and apply adhesive to the back. Apply pattern paper to top of chipboard slats, stagger and layer together. Adhere pattern paper to top of each letter. Decorate with painted chipboard pieces. Adhere matching Mon Amour pieces to top of letters. Add pattern paper to Heart Mini Display Frame. Paint top piece with carbon paint, allow to dry. Apply stickles to the top, allow to dry. 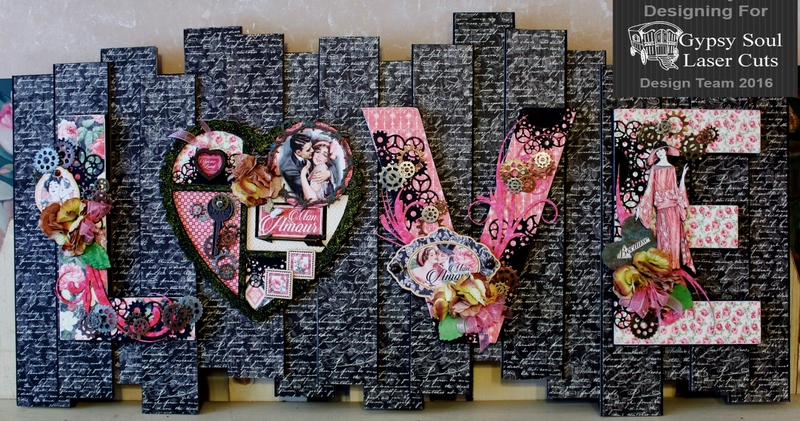 Add pretty flowers to the letters and Heart Mini Display. Adhere more wonderful chippies to the Heart Mini Display. Adhere the Steampunk Doily Set to each of the pieces. Place random gears to the top of each piece. Adhere fun flowers using glue dots. Fussy cut an image from the pattern paper, layer together with pop dots and place on letter "E". Add an image behind painted Heart Word chippy. Place pretty bows on each of the pieces. made with lots of love using Gypsy Soul Laser Cuts chipboard pieces. Make sure to check out the Store...HERE!!!! Also: Entering in the "Give Love with Graphic 45 Challenge"